This is a favourite design of mine at the moment. I love the weight and balance of the carving and it feels really great to carve. The general meaning is below however, I have added some other meaningful aspects to this Tounga (treasure) which are included in the full description. 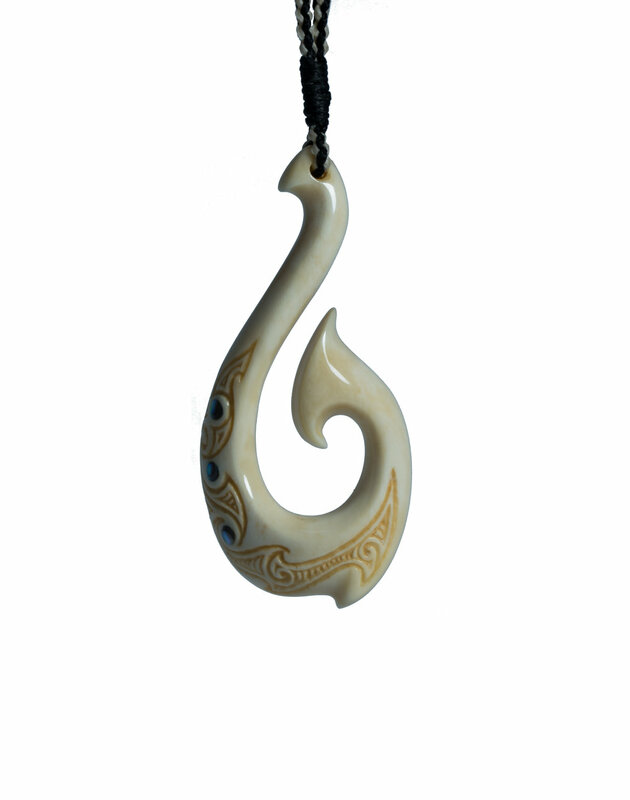 The fish hook bone carving (Matau) signifies abundance, nourishment, and strength. As such it attracts the energies of protection, peace, prosperity, and good health. A fishhook is a symbol that provides safe journey over water. Therefore, it is considered a good luck charm by travellers and seafarers. The fish hook (Matau) signifies abundance, nourishment, and strength. The fish hook (Matau) signifies abundance, nourishment, and strength. As such it attracts the energies of protection, peace, prosperity, and good health. A fishhook is a symbol that provides safe journey over water. Therefore, it is considered a good luck charm by travellers and seafarers. The ocean surrounds New Zealand. On our land, there is a whole lot more water in our freshwater lakes and rivers. Therefore, fishing was very important to the Maori. Kai moana (fish and shellfish from the sea) played a very key role in nourishing the people. As such, they were keen to please the God of the sea (Tangaroa) and other Gods, so to attract an abundant catch. They did this through prayer and other rituals and with blessed Talismans such as the Hei Matau. As such, certain protocol was common such as returning the first fish of their catch to the sea. Given the importance of the sea to Maori, it is easy to see why fishing was a sacred activity. 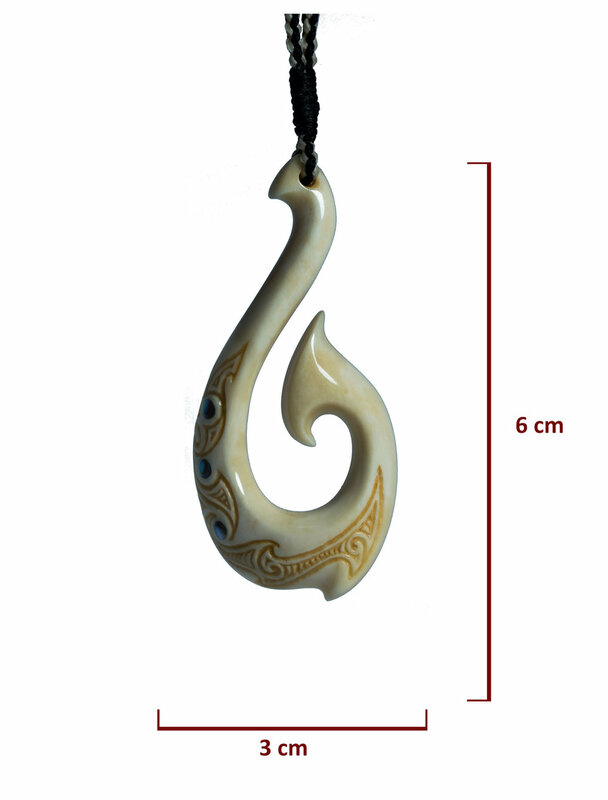 Thus, the evolvement and development of various hooks was prevalent within Maori culture. The ocean is represented by the flow of waves engraved on the front of the carving. Thousands of years ago, the ancestors of Māori journeyed out of South-East Asia and into the Pacific. They sailed in waka (canoes), and were some of the world's greatest canoe builders, navigators and mariners. Their ability to 'see beyond' the horizon was legendary. As such, the Matau is symbolic of navigating our own lives with wisdom and insight. This is attained through spiritual development. Specific to this Taonga: This Matu is called Supreme Delight. This name indicates that through the practices of training in correct spiritual paths, we will increase the supreme delight within our own lives. The three inlays of Pāua symbolise our Body, Speech and Mind. It is upon the basis of these that we create actions that will lead to inner peace and wisdom. This will result in an increased ability to positively impact others and our world system. Thus, attracting the energies of protection, peace, prosperity, and good health is not a passive thing that we wait to ‘happen to us’, but rather an active wisdom that we need to implement within our life.